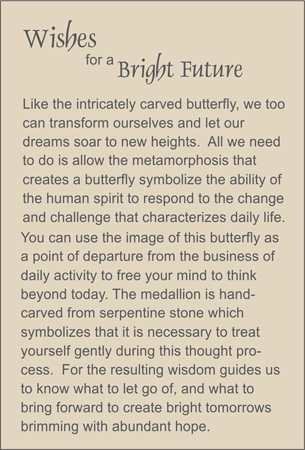 MEDALLION: Taupe-colored serpentine hand carved medallion depicting a butterfly whose metamorphosis can symbolize our need for transformation. ACCENTS: Yellow tiger eye nuggets and smooth rock quartz crystal ellipses. COMMENTS: Butterfly power -- It's what made Neiman Marcus the store it is today. Scroll down to see other styles with butterflies.